In hopes that the volunteers soon would be there. The woods it did call. Proud tulip poplars and hickories, too. Who paused to gaze up at their trunks straight and tall. Note: This was a volunteer project organized by Stone Hill Church on Bunn Drive. I was there in my newly appointed capacity as president of the nonprofit Friends of Herrontown Woods. ("Like" us, if you like.) While others worked on the trail, a volunteer and I rescued ferns, sedges and American holly from the path of the trail. Accounts of previous church-related workdays, back when the church was on Westerly Road, can be found by typing "westerly" in the search box at the top of this blog. Not that anyone planned this, but these three events speak to efforts to integrate nature and environment into other disciplines. Follow the links for more info. This Thursday, Oct. 30, 6:30pm, Princeton biology professor Simon Levin will speak at DR Greenway's Johnson Education Center on "Opportunities in Environmental Stewardship: The Value of Ecosystem Services"
Thursday, Nov. 13, 4:30 - 6 at Guyot Hall, Rm 10, the Princeton Environmental Institute presents: "What Arts are Good For"
Wednesday, Nov. 19, 8:30-4:30, in the Princeton Seminary Library, a symposium entitled "Evolutionary Science and Theological Identity"
The Seminary has an endowed professor of theology and science who recently retired. My grandfather was a chemistry professor who served as a minister at a church during the summer. This symposium might shed some light on recent thinking on how science influences religious identity. One big problem the Princeton Shade Tree Commission is grappling with (I'm a member), is that Princeton is losing about 250 street trees per year--to disease, storm damage, old age--but only 50-100 trees are being planted per year to replace them. The numbers don't add up, and will be even more mismatched after the Emerald Ash Borer arrives. The low number of trees planted is partly due to the expense of purchasing and planting them. Traditionally, saplings of 2-3" caliper (diameter) are planted, which can mean $250/tree plus the cost of digging a big hole to accommodate the root ball. Trees that size quickly eat up the budget and the amount of staff time available for planting. Trees along streets and in parking lots provide many benefits. By shading pavement and transpiring, they keep the town cooler in summer. They catch some of the rain and thus reduce runoff; they absorb some pollutants from the air, sequester carbon, soften the lines of urban spaces. So, is there any alternative to the current steady attrition? 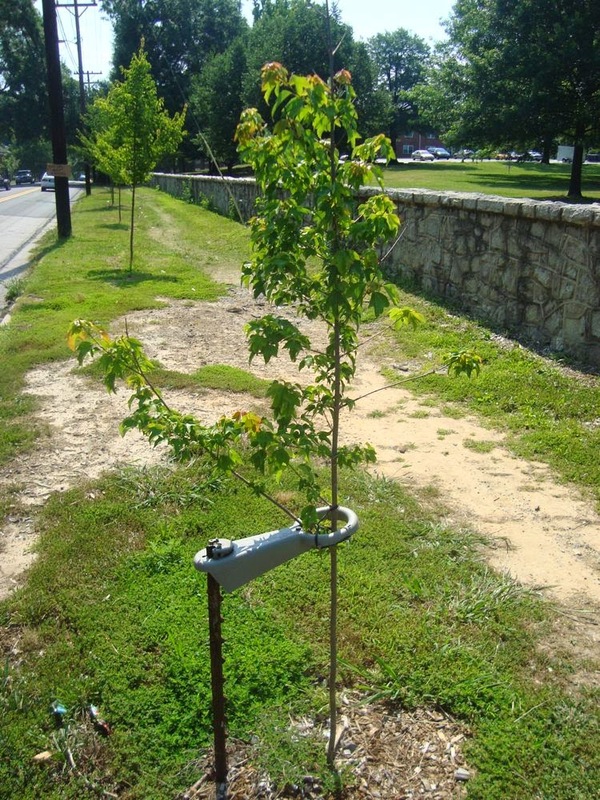 During periodic visits to my old haunts in Durham, NC, I started noticing much smaller trees being planted along streets. This maple's about an inch in diameter, five or six feet high, and is steadied by a simple, reusable stake and ring assembly. If the trees flourish, the advantages are easy to see. Not only is each tree much cheaper, but the hole needed to plant it is much smaller. Small bare-root trees mean less weight to transport, easier handling during planting to insure proper positioning in the hole, and more opportunity for volunteer participation. We have what appears to be a win-win. A general search of the web yielded no information about the relative benefits of planting younger trees. So I ended up calling Durham's arborist, Alex Johnson, to find out how this approach is doing. More detailed notes are below, but here's the upshot: Planting 1" caliper, 5-6 feet high, bare-root trees greatly increased the number of trees that could be planted (from 100 to 500), with less followup care, more potential for volunteer participation, and comparable survival rates. In other words, if we want to shade our streets and parking lots with a limited budget, these smaller trees appear to be the way to go. As with any new idea, this one will have to run the gauntlet of doubt, swim through a sea of skepticism, then jump through a daunting series of logistical hoops--a triathlon that thus far has discouraged any and all rivals from even showing up. These little-trees-that-could might not get much respect when they're first planted, but my observation is that time is good at playing tricks on people, and whether its trees or kids, they grow up before you know it. Among the logistics is finding a nursery that can deliver this size tree, because of the curious route most nursery trees take to market (described below). Less followup care. Younger trees establish faster. Every inch of caliper = an extra year of followup care. Easier planting: A smaller caliper tree means a smaller hole to dig, which means less mechanization (volunteers can do more of the work), and less chance of hitting water or telecommunication lines (the info on the location of lines is not always accurate). Much cheaper: For each 6 foot tall bare root "liner", the cost is $14-22 for the tree, $2 for the plastic wraparound guard at base (weedwhipper protection), and $10 for the stake plus the "T-Mato" that holds the tree in place. The stake/T-Mato can be reused. Total cost is $25-35/tree. 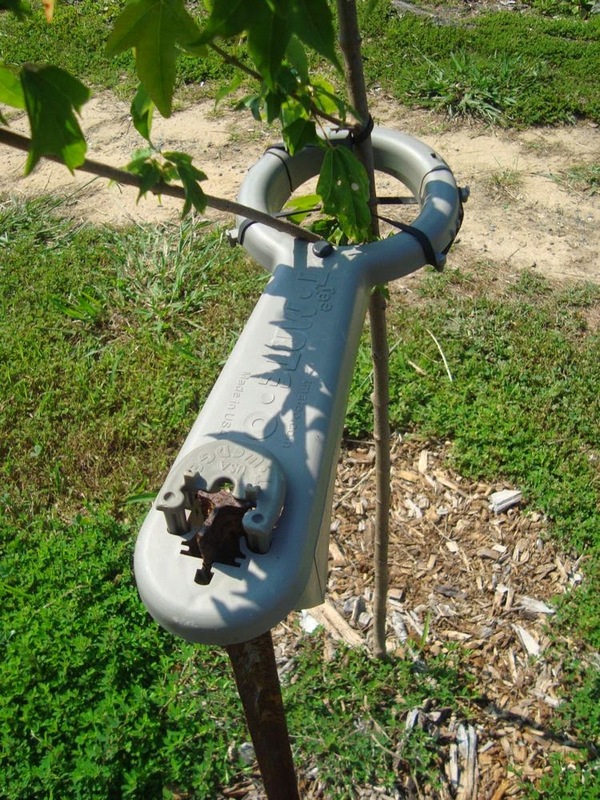 Within 2 years, you have a 2" caliper tree, especially with followup watering. Similar attrition to larger caliper sizes: Though injury is more likely with smaller caliper trees, survival is better. With no followup watering, bag and burlap trees had 20% attrition, compared to 5% for bare root. More pruning required: Smaller trees will need more lower branches removed as they grow. Sight line issues near corners: Small trees can interfere with sight line triangles at intersections, so larger trees should be planted near corners. Avoid containerized material. Alex cites the research of Ed Gillman of the U. of Florida in Gainsville. Pots affect root viability. As seedlings are moved from one pot size to another, each time the roots expand, then spiral, so that one ends up with saplings with compromised circulatory systems. 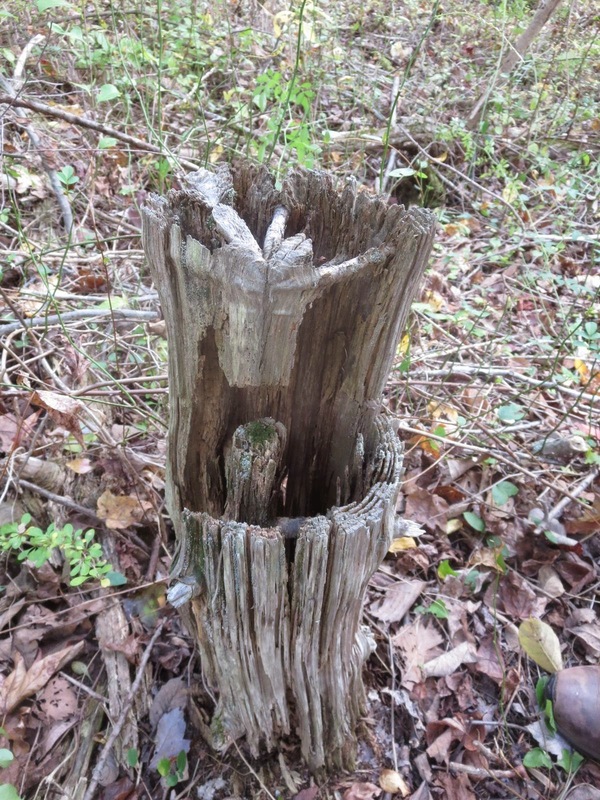 Conducting post mortems on trees that have died prematurely can be instructive. One good option is to go with bare root saplings, which are available from nurseries that provide material for other nurseries. He plants "nursery liners"--trees so named because they have been grown in a line at a nursery. They can be derived from cuttings or grafts. He prefers cuttings, because grafts have compatibility issues. The benefits of using bare root stock are described well at this link. There's been a tendency to plant oversized trees. A lot of nurseries went under during the recession, due to a consequent drop in housing starts and town budgets, both of which reduce the amount of planting going on. This means nurseries got overstocked with big trees and stopped planting new "liners". To avoid oversized trees, he's had to go farther afield to find a nursery with the stock he needs--in Tennessee. However, he thinks there are lots of nurseries in our area. He mentioned Shiktel's, up near Cornell, as one of many. A subsequent call to Shiktel's suggests that it is an excellent nursery, but isn't the sort that provides $20 trees. Their minimum size is 1.5", and a hydrogel treatment to better insure survival of the bare roots brings the per tree cost to $75. Shipping is extra. Interestingly, they say that most trees grown in eastern nurseries start their lives out west, e.g. Oregon, where a long growing season allows the trees to make a quick start. The trees then are shipped east, go through a shorter growing season that makes them less leggy, after which they are ready to sell. Shipping of bare root trees from Shiktel's is either the first two weeks of November or the last two weeks of April. Finding a $20 tree will require finding one of those "nurseries that provide material for other nurseries". An alternative to bare root is bagged and burlapped trees. Volunteers can plant B and B's up to 2 inch caliper. A 1 inch caliper B and B could cost as little as $40. There may be regulations that require a minimum caliper size for planting, but these should be relevant to new developments rather than replacements in existing areas. For volunteers, he goes to neighborhood associations. For 2-3 foot trees given to homeowners (not necessarily to be planted near streets), he suggests partnering with local coffee shops so that homeowners get a free coffee if they come in with a selfie of themselves and the planted tree. For tree forums, he recommended thegrove.americangrove.org. Each state has a group, including New Jersey. There's also the Alliance for Community Trees (ACT), and the Society for Municipal Arborists, which is more technical. Many people have asked me for an update on the raingarden that was bulldozed at Spruce Circle on Harrison Street this past August. The loss of the raingarden, planted on Housing Authority land next to Harrison Street, came as a shock, given I'd been taking care of it for six years. The story gained considerable additional attention when my post was published on the local news site, PlanetPrinceton.com. Since the Housing Authority's apology a week later, I have been working with Housing staff and others to develop a plan not only for replanting of the original raingarden, but assessment of other locations where raingardens could be planted as well. The aim of these plantings goes beyond aesthetics. The importance of pollinators for food security is more in the news lately, as is the uncertain fate of the monarch butterfly's miraculous migration. All of this is getting people to look at landscapes with the needs of pollinators in mind. That's what we were doing at Redding Circle last week, in a detention basin at the corner of Ewing Street and Mount Lucas, hidden behind a fence, where the runoff from a Housing Authority complex accumulates before being piped into Harry's Brook. "We" was Housing facilities staffer Jim, Brian Marsh of Partners for Fish and Wildlife, Heidi Fictenbaum of the Princeton Environmental Commission, and Greg O'Neil of Princeton public works. Heidi, in an initiative parallel to my own, has developed an inventory of Princeton's many detention basins, with the aim of retrofitting as many as possible for habitat. The question being pondered was how to turn a detention basin filled with exotic fescue, stiltgrass, and invasive porcelainberry vines into a foodfest for pollinators, while actually reducing the maintenance Jim and his staff need to do. When standing in a rather drab detention basin talking for 45 minutes, it helps to be all the while visualizing a field full of New England Aster and late boneset, like these that are prospering along Nassau Street in front of the Whole Earth Center. The magic of raingardens and their larger cousins, detention basins, is that the soil is more frequently wet. That wetness means easier planting and weeding in the soft soils, less followup watering, and increased chance that the native species so well adapted to growing in wet, sunny ground will thrive. We came up with a plan, jotted down and sent around by Heidi: Reduce mowing to once every year or two, knock out the porcelainberry vines, plant native wildflowers in the wettest, lowest part of the basin, and close the gate so the deer have a harder time getting in. I then took Brian--whose federal Partners agency has helped with basin conversions in the past--at the Princeton High School and at Farmview Fields--on a whirlwind "great basins of Princeton" tour, to see if we could turn additional basins into aesthetic feeding stations to support pollinators. The massive one in this photo is just up from the Charter School. Again, it helps, when looking at this mass of undifferentiated turf with its existential "sidewalk to nowhere" running down the middle, to imagine schoolkids helping to plant shrubs and wildflowers, and returning the next year to learn about the sorts of pollinators that make their lunch possible. Next stop was Smoyer Park, which has a promising basin that receives runoff from the parking lot. A meadow would provide better filtration of the runoff than a mowed lawn. We also visited a basin out Rosedale Road at Greenway Meadows. Unfortunately, Partners for Fish and Wildlife, like most federal agencies, have been hampered by Congress' sequestering of funding, so may not be able to help out as much as in the past. Still, there's a chance they can do enough to kickstart this local initiative. Meanwhile, back at the Spruce Circle location, replanting of the bulldozed raingarden could include replacement of these winged euonymus shrubs, which are constantly overgrowing their location and have made for a jarring visual behind the rain garden. To be planted in their place, if the plan is approved, would be something similar to this--a mix of Virginia sweetspire, Fothergilla, highbush blueberry and oak-leaved hydrangia. The moral of this story, still early in the telling, is to turn lemons into lemonade. Or, for those who think like a pollinator: turn turf into nectar. I first noticed it on the Veblen House grounds, where some volunteers at a Rotary workday had cut down a multiflora rose bush that had long stood in a knotty tangle in the bed of iris in front of the house. The volunteers, Steve and Teresa, braved the thorns, cut the stems and dragged the giant weed over to a pile at the edge of the woods. The intelligent thing to do next in that situation would have been to treat the cut stems with a tiny squirt of 20% glyphosate that would then transfer into the roots and prevent any resprouting. I didn't, though, choosing not to wield chemicals during a workday. The intent was to follow up later, so the shrub wouldn't regrow. Fortunately, no followup has been necessary. The shrub has not grown beyond the stubs. So what's going on? Two things are stunting the shrub. Some of the leaves are red--an indication that the rose is being attacked by rose rosette disease. But in addition, the deer are eating the fresh sprouts. Herein lies reason for hope. High deer numbers in combination with invasive species has long been spelling trouble for ecological balance. The deer are accustomed to eating native plants, which gives exotic plants a competitive advantage in forests and fields. Every land manager has dreamed of the day when deer would take a liking to exotic invaders and give the natives a break. 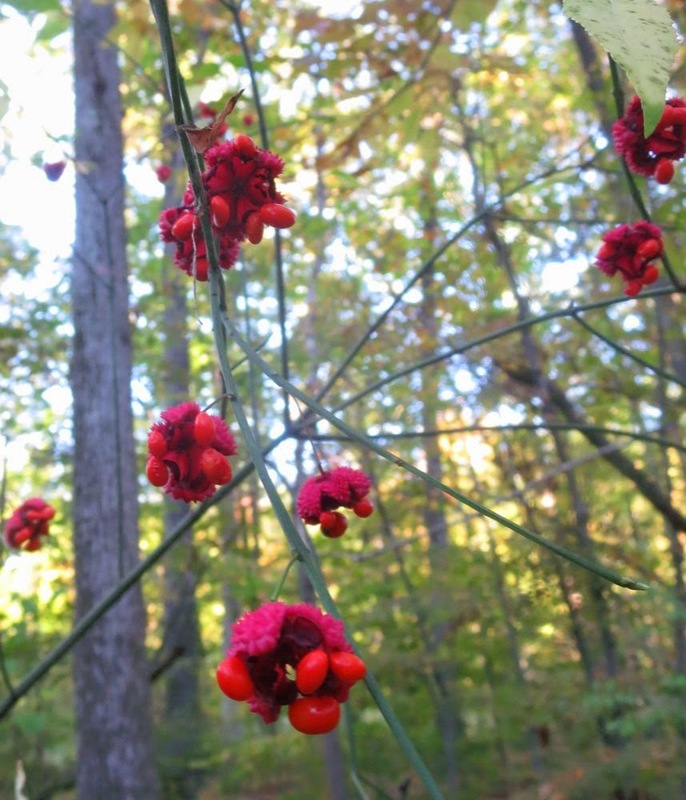 Nearby in Herrontown Woods, there's more good news to feed that dream--another invasive exotic, winged euonymus, that was cut down and hasn't regrown despite lack of treatment with herbicide. Its shoots, too, show signs of having been browsed repeatedly by deer. So, here's a concept: By cutting invasive shrubs at a convenient height along pathways that deer frequent, we can tempt them with tender (re)sprouts of the invasive species they would ordinarily reject. Once accustomed to eating the tender sprouts, they might start eating the more mature vegetation. 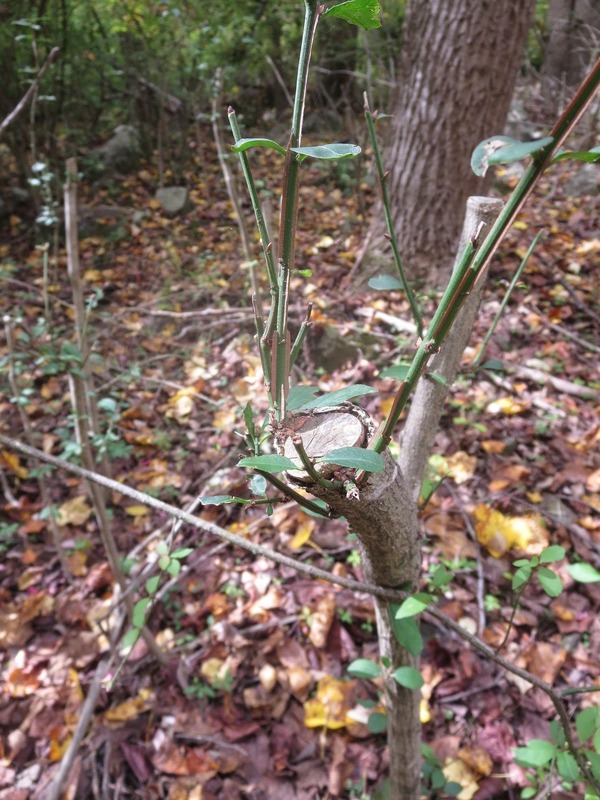 It would be a boon for the deer, since most woods are packed with invasive shrubs--a potential food supply that up to now has gone begging. There may be an art to this, or at least some craftiness. Since deer are creatures of habit, it may mean learning their routes, cutting where they are most likely to pass by, at times of year when they are the hungriest. And might deer take a visual cue--if the resprouts are cut with clippers, might a deer see that as evidence of browsing by other deer, and conclude that it must be edible? In any case, it's a way to entertain hope, and possibly enlist deer as partial allies. and dappled boulders blooming in the creekbed. The day included two sightings of pileated woodpeckers. Look up when the trail comes near a stream, and you may see the flowers of witch hazel about ten feet overhead. and even one patch of Hearts 'a Burstin', also known as strawberry bush or Euonymus americana. and a demonstration of nutrient recycling rendered as fall beauty--leaves in their natural habitat. Herrontown Woods is accessed by car or bike, across Snowden Lane from the entrance to Smoyer Park. A related website and initiative can be found at VeblenHouse.org. 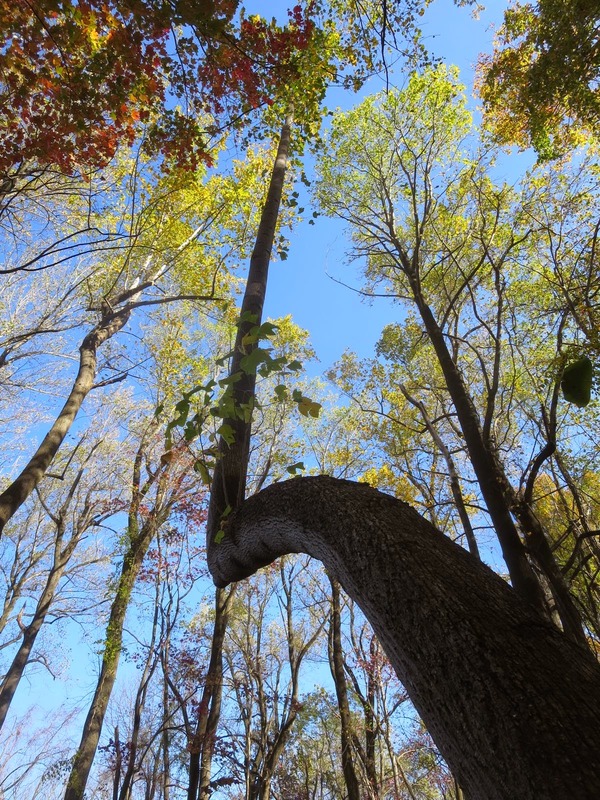 See some of Sally Curtis' photos of Herrontown Woods at the Friends of Herrontown Woods facebook page. You can track the monarchs' fall migration with weekly updates at this link. It's heartening to hear the numbers are up from last year's record low, but they still have a long way to go to rebuild the population. The migration is not a steady slog from the northern U.S. and Canada to their winter home west of Mexico City, but instead comes in fits and starts. When the winds are from the north, monarchs can travel more than 100 miles/day. When winds come from the south, the monarchs hang low, feed on whatever flowers present themselves, and wait for favorable winds. To a considerable extent, they hitchhike to Mexico on the wind. Though I saw only a couple monarch caterpillars all summer--this one was on a stray common milkweed growing at our town tree nursery at Smoyer Park--there was a memorable moment in the backyard garden when a monarch flew in its powerful but phantomlike way in a broad circle around me several times. Along with monarch migration updates, the learner.org site also describes the fall migration of dragonflies, which in at least one instance kestrels are known to accompany. The kestrels chow down on the dragonflies as both species head south. In other words, the food kestrels need travels with them, which is more than one can say for airline travel these days, and of course the kestrels are using a sustainable energy source to get around. Now that I'm not spending time in parks pushing my kids on the swings, I'm missing the annual dragonfly festivals, in which a layer cake food chain spontaneously appears above the playground. Winged insects emerge from an underground nest, disperse above the lawn, get feasted on by dragonflies that in one case attracted swallows wishing to snack on the dragonflies. It's a rare show of nature's abundance--the sort that Rachel Carson describes in Fable for Tomorrow, the three page first chapter of Silent Spring. A National Geographic post describes the similarities dragonfly migrations have with those of birds. After Emerald Ash Borer, What Will Princeton Look Like? Back in July, I took a trip to the future. 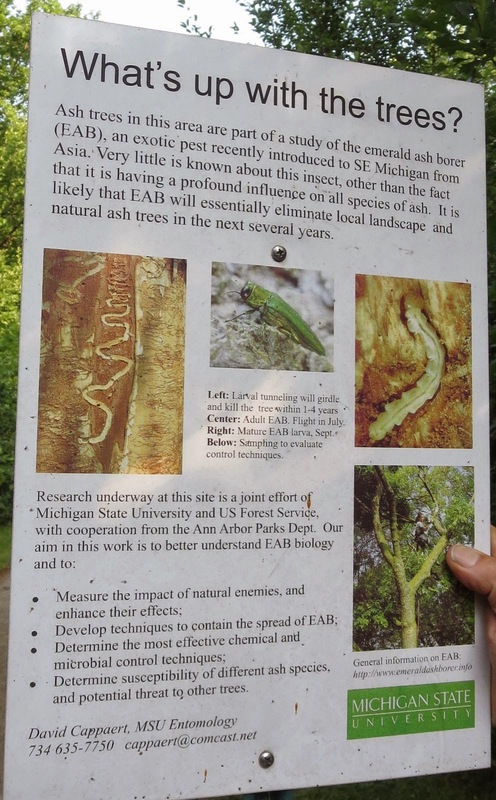 Princeton still has a few years before the emerald ash borer is expected to decimate our ash trees (what a cheery sentence that is), but Ann Arbor, MI, has already weathered the EAB storm. The city is located less than an hour away from the original introduction of the insect, which went unnoticed in the Detroit area from the early 90s through to 2002 when it was finally identified. The introduction was likely via wooden shipping crates arriving in Detroit/Windsor from China. Ann Arbor's tree removal lasted ten years and cost $5.8 million. What does this city of 110,000 look like now? By chance, my trip to Ann Arbor coincided with a visit by college friend and early EAB researcher Dave Cappaert. 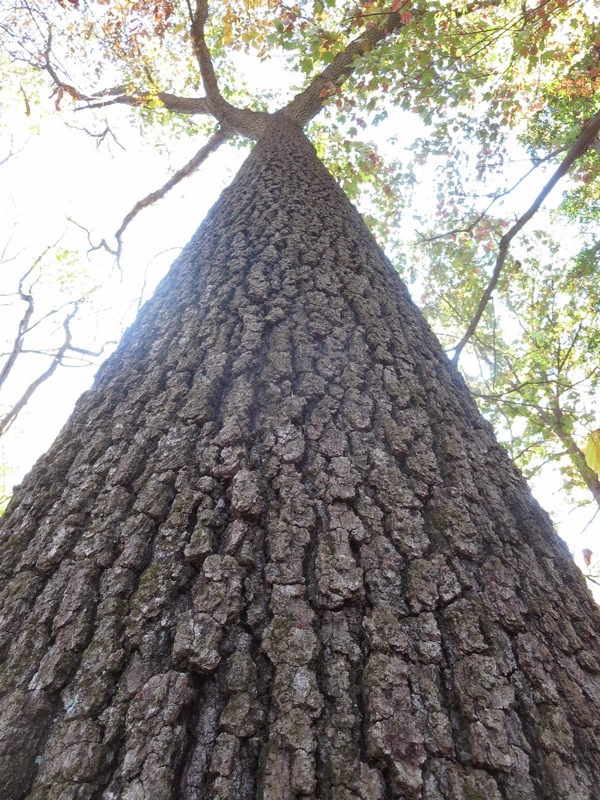 We visited County Farm Park, one of the sites where he and fellow entomologists did the dirty work of cutting open some 10,000 ash trees to study the behavior of the emerald ash borer and search for parasites that might help control its numbers. While immersed in research on EAB, Dave discovered a formerly unknown braconid wasp that parasitizes EAB larvae, and now bears his name: Atanycolus cappaerti. Other useful parasites have also been discovered, here and in China, and they could play a role in reducing the number of emerald ash borers that continue to affect ash trees after the first mega-wave of ash borers passes through an area. There's a video that gives a brief history of EAB (complete with darkly evocative sound effects) and then describes three parasites of EAB that were found in China and are now being released in the U.S. after thorough testing. There's a bit of good news. 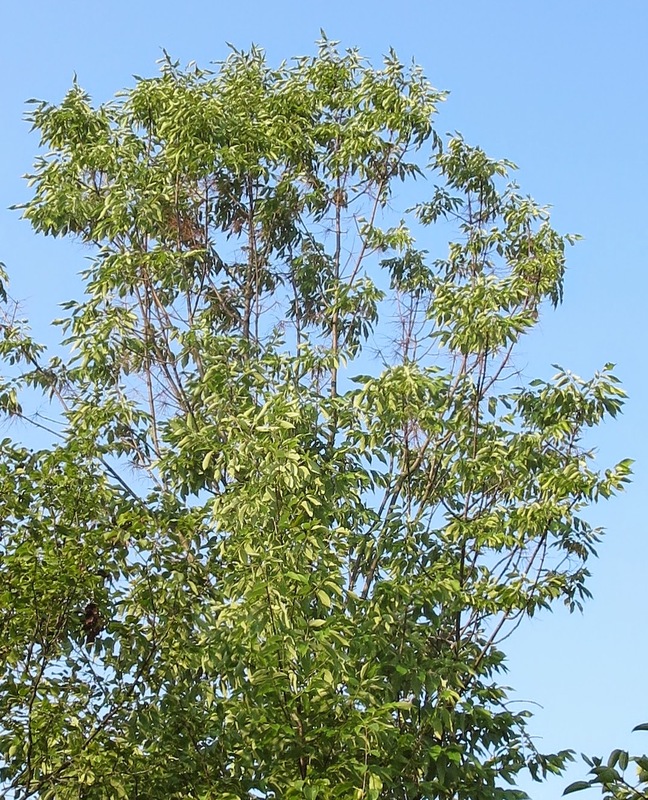 Valued ash trees along streets or in yards can be spared, for a price. And wild ash trees do not disappear altogether. We found 20 foot tall ash trees making a go of it, here and there. Dave says that 80% of the EAB larvae get eaten by woodpeckers. It's still a mystery how the woodpeckers are able to locate the larvae under the bark with such consistent precision. Here's a young ash showing the outer symptoms of EAB attack. I would speculate that, once the native and introduced parasitic wasps become widespread, they in combination with woodpeckers could allow ash trees to persist in Princeton, though perhaps few would grow to maturity unless regularly treated with systemic pesticide. While we were walking around, Dave found one of the signs he and other researchers had placed around the park years back to explain why they happened to be pulling the bark off of thousands of trees in a public park. Click on the photo to make it more readable. Here's an ash tree showing signs of dieback on the upper right--likely to be a common sight in Princeton in coming years. It's important for those who have ash trees in their yards to know that those trees can be protected with systemic pesticides. Not all the available pesticides are equally effective, however. Though imidicloprid is being frequently recommended locally, the experts in other states that I've spoken to have all recommended emamectin benzoate (brand name Tree-Age, or Arbor-Mectin). 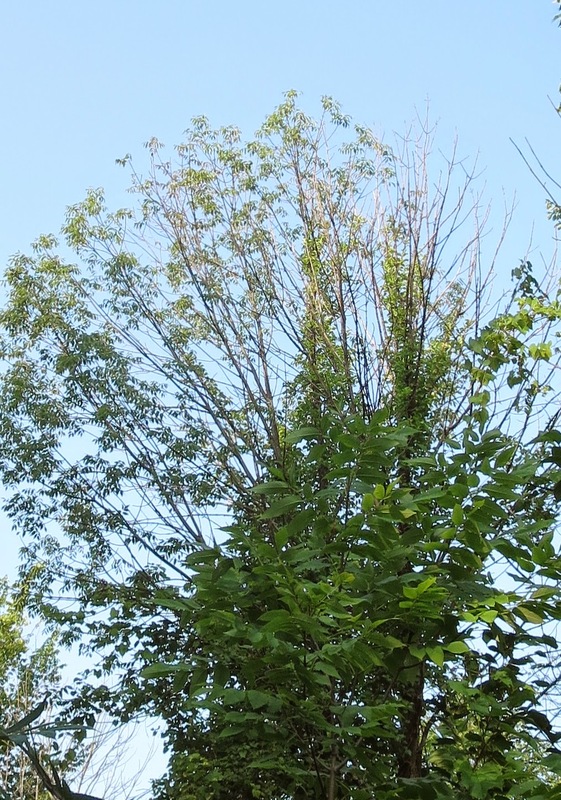 "Burnsville is so sold on that idea of saving trees, rather than cutting them down, that it plans to encourage residents to treat their trees by extending to them the rates the city receives for pesticide injection. " 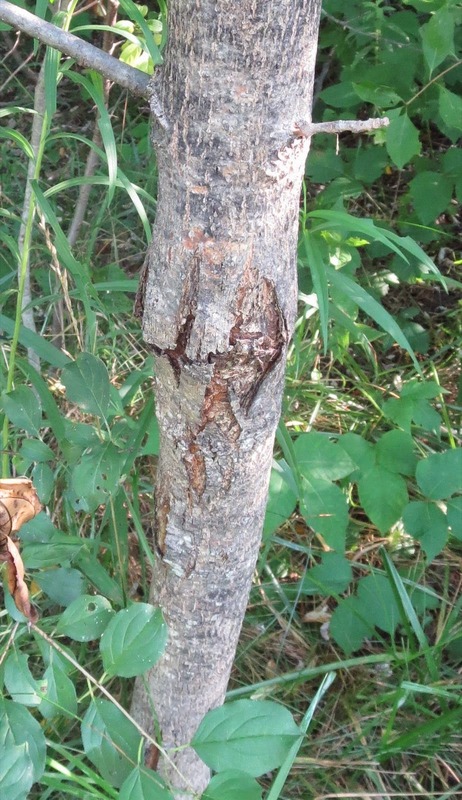 Curtis Helm, a former Princetonian and currently an urban forester in Philadelphia's Parks and Rec department, advises against using imidicloprid on trees larger than 16" diameter. He says Philadelphia is treating 1000 ash with Tree-Age. In a previous post on the subject, I included notes from an extended conversation with Donald A. Eggen, Division Chief of Forest Pest Management Division of Pennsylvania. He, too, strongly recommended Tree-Age rather than products that use imidicloprid. The emamectin benzoate, last time I checked, was more expensive, which may explain the local preference for imidicloprid, but that cost differential is reduced when the frequency of application is considered. Note: The Arbor-Mectin formulation is said to be absorbed into the tree more quickly than Tree-age, and therefore can be less expensive to apply. Both use the same active ingredient. Any decision about how Princeton should proceed with pesticide applications (some homeowners have already begun applications, given that EAB has been discovered 25 miles north of here), should weigh heavily the input of those in Michigan, Pennsylvania and elsewhere who have benefited from years of experience. Sailing is a lot like gardening in that it teaches one to work with nature rather than against it. 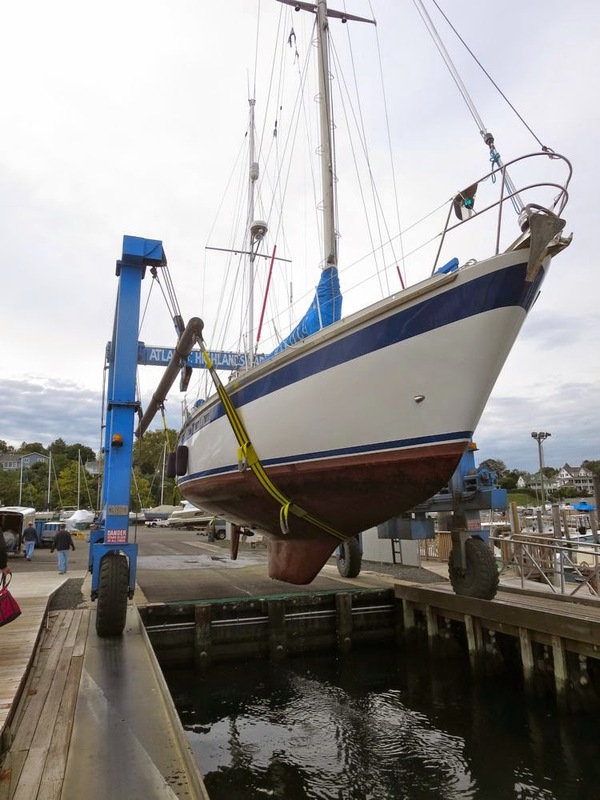 Yesterday, I helped a friend get his most-amazing sailboat ready for the winter. I say most-amazing because I had not before been on a sailboat that's been around the world three times. My previous notion of a great sailing adventure came from camp counseling days when I took some high school kids from Camp Innisfree, near Sleeping Bear Sand Dunes, out to Lake Michigan's South Manitou Island in a daysailer. This boat, called Makulu, which in an African language means "big happy Momma", is equipped to nurture far greater ambitions. For the time being, though, it will spend the winter with all the others, parked on stilts. Among the emotional struts keeping my love of sailing well supported and ready to launch at any moment through all these non-sailing years is surely that feeling of acceleration experienced many decades ago when a strong breeze hits the sails. There's the sheer elegance and gracefulness of sailing, the economy of well-trimmed sails, the great good luck--a sort of alchemy--of being propelled forward with no effort beyond keeping a good grip on the rope and tweaking the rudder. Sailing permanently associates the elements of sustainability--renewable energy, efficiency, reuse--with pleasure. Experiencing how something invisible can power travel is also good training for understanding how carbon dioxide could be so transformative. While big happy Momma was getting a good powerwashing to knock off the accumulated barnacles and algae, I decided to do some seaside botanizing. A jumble of concrete may not look like the most promising spot to explore, but it yielded some beauty and meaning. First seen was an encounter between two grasses. The smaller one I'll say is smooth cordgrass (Spartina alterniflora), with the proviso that my coastal botany chops haven't been refreshed since the days of reading Rachel Carson's descriptions of two species of Spartina in the salt marshes decades back. In the background, taller and with pompoms for seedheads, is Phragmitis. It's a pretty picture, but there's drama beneath the tranquility. Phragmitis is both beautiful and a botanical bully. In a freshwater wetland, it is the uber-invasive exotic, able to overwhelm even the aggressive native cattail. Here, the peaceful scene shows nothing of the underground battle being waged, as the Phragmitis' rhizomes invade the cordgrass' territory, ready to outcompete, overshadow, and ultimately displace. Meanwhile, the smooth cordgrass, loved as an integral part of the coastal ecosystems of the eastern seaboard, is proving detrimental and bully-like where it has been introduced into the differently evolved marshes of the west coast. As they say in real estate: location, location. Here, the cordgrass plays off the sailboat masts in the distance. 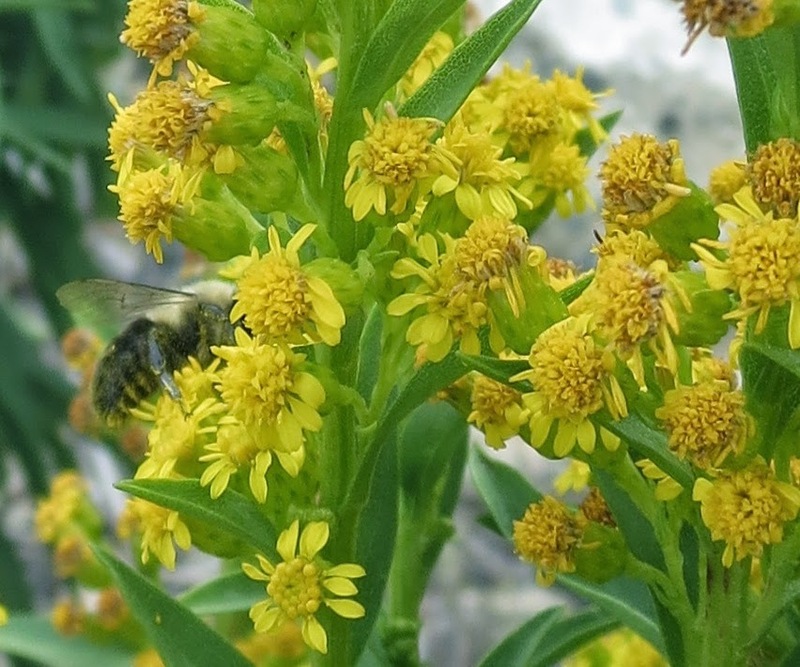 One tough beauty blooming in the rubble is Seaside Goldenrod, Solidago sempervirens. 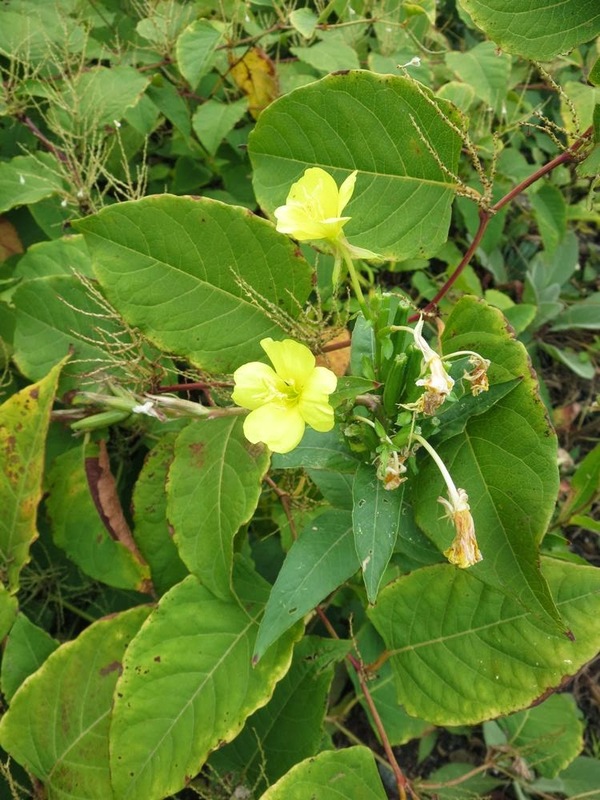 Here's an evening primrose growing up through Japanese knotweed. The knotweed, whose invasive tendencies seem muted by the salty environment, grows next to a big clump of native indigo bush (Amorpha fruticosa), a legume whose acacia-like, bluegreen foliage can provide an appealing contrast in a backyard garden. All this mixed talk of beauty and invasiveness is really about balance, which sailing teaches as well. Give us wind, but not too much or too little. 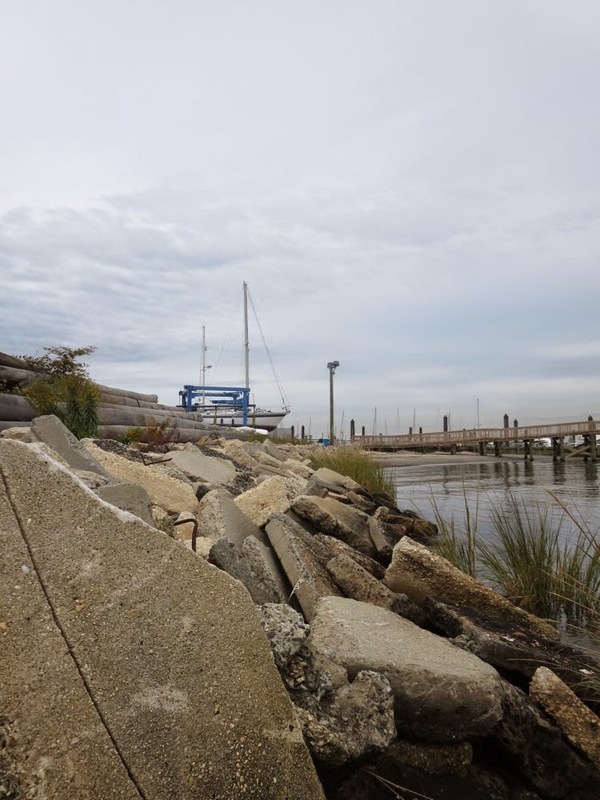 Nearly two years ago, this sailboat and all the others at this marina got a big gulp of too much wind, when Hurricane Sandy rolled in, piled boats as if they were toys, and sank this sailboat in the harbor. To salvage the mast if nothing else, it was deemed worth pulling up out of the muck. The plants, I'm sure, dusted themselves off and went back about their business of growing. 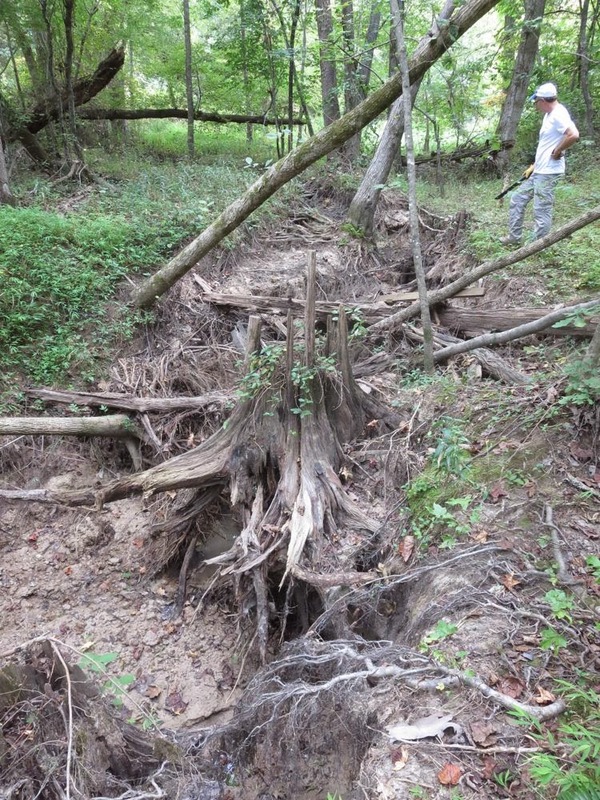 During my visit to North Carolina last month, my friend Perry took me to see how erosion can destroy a creek. Just last year, there had been a healthy, shallow, narrow creek meandering through this section of a wooded valley. What we found on this visit was a ditch eight feet deep. Trees had fallen as erosion undermined their roots, the ground pulled out from under them. This land is protected--preserved for all time--and yet the stream appears to be self-destructing within the boundaries of this nature preserve. How this happens is completely counterintuitive. There's no rogue backhoe tearing at the tree roots, no misguided government policy like the channelizations of streams that happened in the 1960s. Though we usually think of erosion as being a process that degrades a stream from the top downward, this demolition starts downstream and heads up. Furthermore, the valley upstream of this section is undeveloped beyond a few scattered homes. The process at work can be seen in the lower left of this photo, where there appears to be a ledge, a sudden dropoff in the mud. That's what's called a "head cut". As water flows over that ledge, it erodes the face of the dropoff, causing the ledge to gradually shift upstream. The same process is at work on a much grander scale at Niagara Falls, which is slowly but steadily moving upstream from where it was millenia ago. It's like the streambed were a loaf of bread that someone has been cutting slices off of, slice after slice, heading upstream. How did this process of destruction get started? On the map, there are two branches of a stream that flows northward (bottom to top on the map). 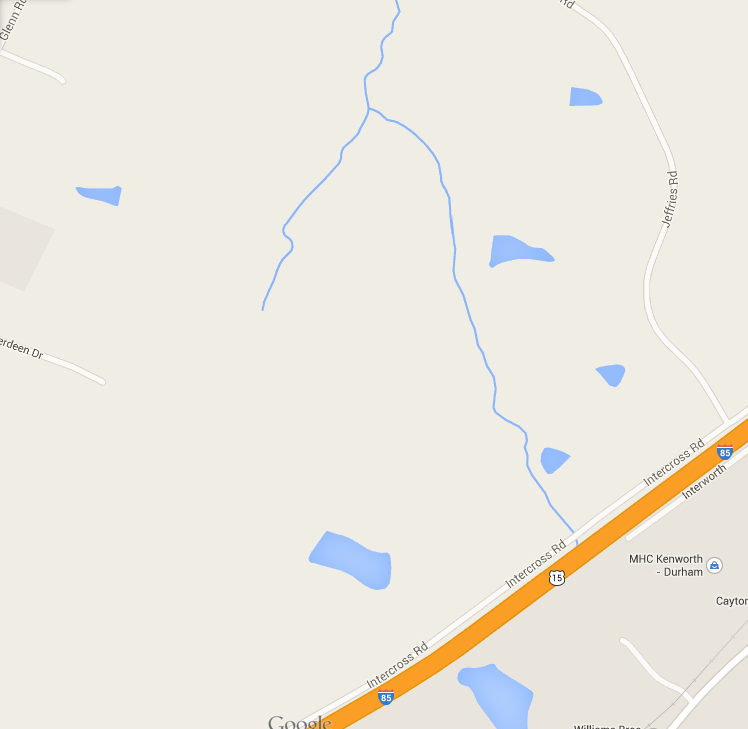 At the lower right is I-85. Tens of thousands of people drive peacefully by every day, their ride made smooth and safe by that broad ribbon of carefully engineered concrete. Not one of them is aware that the road, a ribbon of impervious surface, sheds copious amounts of stormwater, which then barrels down the creek, creating enormous erosive pressure. Somewhere miles downstream, the bottom of the creek gives way. A headcut begins, which then "travels" upstream, back towards the source of the eroding stormwater, consuming and deepening the creekbed as it goes. Though the little branch of the creek on the left of the map, the one we visited, isn't downstream of the freeway, the erosion of the main branch created a headcut that then headed up the smaller branch as well. We looked at the soil. It was sandy rather than piedmont clay. At this point, Perry pointed out that the headcut was moving upstream so fast--we estimated 200 feet of creek consumed by erosion in the past year alone--because the soil it was cutting through had not been there a few hundred years ago. During the heyday of tobacco farming, the soil that washed off the fields accumulated in the valleys. The stream is actually cutting down through layers of silt deposited during the agricultural era. This might suggest that the erosion is actually helping the creek return to its historical level, but the result will not be restoration. Even though the creek may end up down near its original level, the valley's vegetation is still perched high on all the silt. The creek has become disconnected from its floodplain. The water table in the valley drops to match the level of the creek, which makes the vegetation more susceptible to drought. A healthy creek floods easily and often, in the process dissipating energy and watering the surrounding floodplain vegetation. A deeply incised creek floods rarely, so that all that weight and power of water puts erosive pressure on the creek banks, detaching the stream even further from its natural interaction with the floodplain. Aquatic life has a hard time of it when its home is being either eroded away or buried in silt. Christmas ferns and witchhazel will still grow on the slopes of the valley. But the valley is changed. The headcut has reached a spot where a beaver dam had created a wetland. Chances are, the headcut will undermine the dam and drain the wetland. Yet another example in our world of how cause--the building of an interstate a half century prior--can be so distant in time and space from ultimate effect.